The Zeal Lofts on N Williams (currently addressed as N Vancouver) will include 205 micro units. The project is being designed by Jackson Main Architecture for developer Vibrant Cities. Every week, the Bureau of Development Services publishes lists of Early Assistance applications, Land Use Reviews and Building Permits processed in the previous week. We publish the highlights. This post covers June 11th to June 17th, 2018. Construction of a new 3-story, 34-unit apartment building (all residential). Demo existing restaurant and replace with a new 2100 sq ft single story building for a new restaurant. Parking, exterior terrace, landscape, and stormwater facilities, and sidewalk improvements are included in the scope of work. 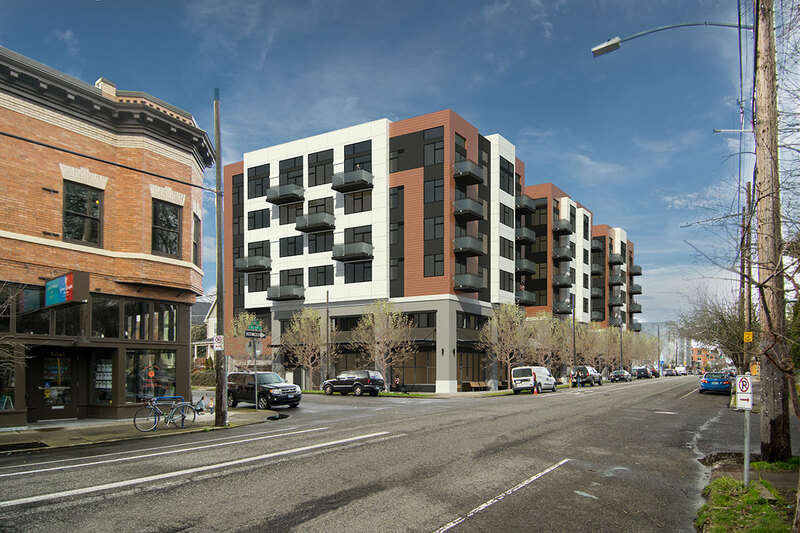 Construct two 6-story market-rate apartment buildings with ground floor retail and basement parking. Modifications requested to bike parking width and vehicle stall size. 100-day-review-timeline. Construct two new buildings and renovate existing building which is a contributing resource in the Alphabet Historic District. A total of 148 affordable housing units across the three buildings. Addition to existing skilled nursing facility including 18 new beds. See 18-103623-LU. New 3-story mixed use building, west wing has (3) retail spaces on level 1, (4) office spaces on level 2, and (4) apartment units on level 3. East wing has tuck-under parking and (12) apartment units.